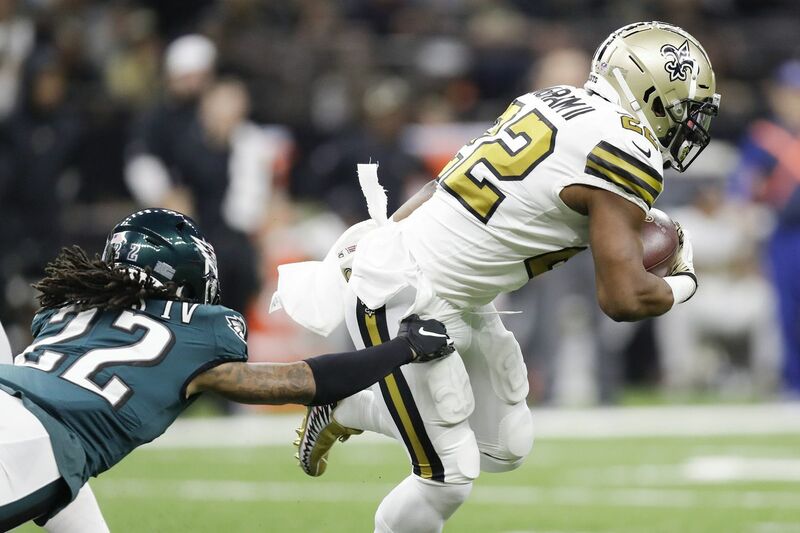 Mark Ingram evades a tackle attempt by Sidney Jones during the Eagles’ loss on Sunday. NEW ORLEANS – TFLs, Fletcher Cox said last week. TFLs would be the key Sunday to stopping Drew Brees and the Saints' unstoppable offense. "We have to get TFLs [tackles for losses] on first and second down," the Eagles defensive tackle said. "If we can do that, the sacks will come." The TFLs didn't come and neither did the sacks in the Eagles' embarrassing 48-7 loss to the Saints at the Superdome. A run defense that hasn't been very good for a while now, gave up 173 rushing yards and two touchdowns to the Saints, just a week after Ezekiel Elliott and the Cowboys had their way with them, and a month after Giants rookie Saquon Barkley made them look foolish. Their futility against the run just made it easier for Brees to shoot fishes in an injury-riddled defensive secondary barrel. The Saints quarterback completed 22 of 30 passes for 363 yard and four touchdowns. He never came close to throwing an interception, and the Eagles never came close to sacking the 39-year-old Hall of Fame-bound signal caller. Brees leads the league in passing. Leads the league in third-down passing, as well. But if the Eagles could have put him in some third-and-longs, well, they at least would've had a chance. Brees entered the game with a 118.8 passer rating on third down, but it dropped to 94.4 on third-and-8 or more. Just eight of his 25 pass attempts on third-and-8-plus had produced first downs this season. But just three of the Saints' 11 third-down situations against the Eagles were longer than 6 yards. Six were 3 yards or less. The Saints converted six of their first eight third-down opportunities, before going 0-for-3 in fourth-quarter garbage time. The reason for the scarcity of Saints' third-and-longs was the run defense. On the Saints' first play of the game, running back Mark Ingram ripped off an all-too-easy 38-yard run, and Ingram and Alvin Kamara were off to the races. The Eagles, who had one of the best run defenses in the league last year on their way to a Super Bowl title, entered the game ranked 23rd in opponent rush average (4.7). They had been allowing 4.75 yards per carry on first down, including 7.6 per carry in the last four games. Things got even worse Sunday. In the first half, the Saints averaged a stunning 9.1 yards per carry on first down. Seven of Ingram's and Kamara's 10 first-half carries gained 5 yards or more. Cox, who entered this season with aspirations of winning the league's defensive player of the year award, was invisible Sunday. That went for after the game as well when the guy who has taken so much pride in being selected the team's defensive captain, snuck out of the locker room before reporters could talk to him. Same thing for safety Malcolm Jenkins. Josh Hill (center) leaps over Malcolm Jenkins in the first quarter. Jenkins was pretty much invisible throughout the Eagles’ loss on Sunday. Linebacker Nigel Bradham, who was such an important part of last season's defensive success, but has not played nearly as well this season, refused to talk to reporters. Two of the precious few players who were willing to stand by their locker and answer questions were defensive end Chris Long and linebacker Kamu Grugier-Hill. Long was brutally honest about his unit's lousy performance, particularly against the run. "The run defense sucked," he said. Long won't know exactly why it sucked until he looks at the film with the rest of his teammates and coaches Monday at the NovaCare Complex. But it was a lot of the same things that have been hurting them for weeks now: bad tackling, people unable to get off blocks, poor gap control, etc. "Probably slightly different problems," he said. "I don't know. We're going to have to look at it [on film]. Hard for me to make a diagnosis right now on where the runs were hitting. "I just think the key is everybody has to focus on doing their job, and not try to do too much because we're losing. "When the chips are down, you can't do your own thing. We have to tackle this thing as a team. And that's what run defense is about. So we have to see what happened." The back end of the defense can use injuries as an excuse. But not the front seven. Yes, defensive end Derek Barnett is out for the season with a shoulder injury, and tackle Tim Jernigan has yet to play as he recovers from offseason back surgery. But they still have enough healthy talent that they shouldn't be getting gutted by the run the way they are, especially on first down. "Tackling's the biggest thing," Grugier-Hill said. "We're not tackling right now. Inside, outside. Just not tackling. I don't know. "They did a good job at mixing it up, motioning guys and keeping it kind of confusing for us. But, honestly, a lot of it just came down to tackling and execution. Same issue we've been having." They'd better solve those issues fast. Because Barkley's waiting for them again next Sunday.